Beautiful, unique, and packed with brilliant detail, Vargic’s Miscellany of Curious Maps showcases Slovakian artist Martin Vargic’s rare talent as never before that is sure to be treasured by Map Fanatics. Along with eight exquisite and unexpected conceptual atlases, he has imagined The Music Map, The Map of YouTube, The Corporate World Map, and many more. 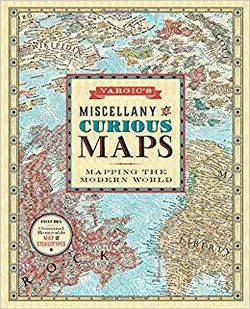 Extensively mapping various subjects from all corners of our modern civilization, Vargic’s Miscellany of Curious Maps is a fresh and thoughtful look at Western culture that will spark conversation and continually surprise and fascinate readers.